Today, 07th Expansion manages gives the beauty of two special ads such as Umineko no Naku Koro ni Saku ( Umineko When They Cry ) and a new entry in the Saga. At the moment, carries the provisional title ●● no Naku Koro ni (●● When They Cry). 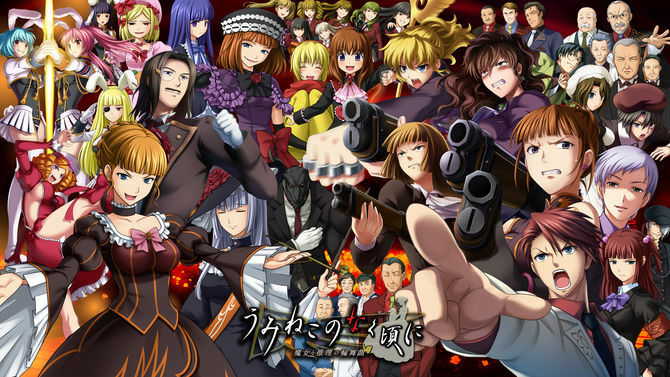 Umineko no Naku Koro ni Saku will be an “all-in-one” pack, something similar to Higurashi no Naku Koro ni Hou. In the image below you can see on the left a small part of what will be the illustration of the box art of Umineko no Naku Koro ni Saku, while on the right you can take a first look at the main character of no Naku Koro Ni. All this contain Umineko no Naku Koro ni, Umineko no Naku Koro ni Chiru, Umineko no Naku Koro ni Tsubasa and Umineko no Naku Koro ni Hane in the first album, while the second should offer a new scenario created specifically for this collection and many others extra content. The illustrations will be made by Ryukishi07 and Updated 07/15/18 at 1:25 a.m. It is good to specify that this sort of all-in-one pack is not the same as announced last March by Entergram.